Today, the first day of February 2017, should have been the first day that members of the Hawaii GOP could have taken back their party from the RINO's. Every two years, pursuant to our party's rules, card-carrying Republicans at the grassroot level are theoretically allowed to decide the direction and leadership of our party. But, in today's newsletter, HIRA has some extremely disturbing news to share that this year' s party elections have been rigged by party leaders. With our party in a downward spiral, local Republicans have grown desperate for new and better party leadership in order to end the Hawaii GOP's seemingly endless losing streak for state, county, and federal offices. But that would require tossing out the cabal of status quo RINO's led by Miriam Hellreich, Fritz Rohlfing and Gene Ward. And these establishment liberals won't go quietly into the night. How so? Outright cheating would be the single most likely way for the current RINO establishment do-nothing party leaders to retain control of the downward-spiraling Hawaii GOP. Based on the results of HIRA's investigation and compelling evidence, it's clear that Team Hellreich's lack of respect for party rules, lack of a conscience, lack of embarrassment at perennial ballot-box losses, and utter shamelessness concerning non-stop party scandals, and the increased desire for party members to clean house has led RINO's to invoke 'the cheating option' in 2017. Spoiler Alert : Yes, widespread cheating by Team Hellreich across the state has begun, and it's not pretty. The election of party officers in 2017 has been rigged. Yes, these are actual rigged elections; not by the Russians, but by our own dishonest and corrupt party leaders at GOP headquarters on Kapiolani Boulevard. The proof is below. THE GOAL OF CHEATING THRU SECRET CAUCUSES : But, in order to participate, you'd have to KNOW that these 51 events were even taking place. If, thanks to nonexistent promotion, nobody in a district holds a meeting or if nobody shows up, Rohlfing gets to appoint the district chair and retain majority control of the party's governing state committee which, as HIRA has proven, is largely comprised of appointed do-nothing drones, including actual Democrats, closet Democrats, and RINO's who are collectively responsible for the steady decline of the Hawaii GOP. MAJOR CHEATING #1: Notification POSTCARDS cancelled. Every two years wihout fail, postcards (like those below) have been mailed out by Hawaii GOP headquarters (where the member database is housed) to ALL party members to insure that, well, ALL party members know the date, time, and location in advance for their state house district's caucus. Such postcards also get mailed to promote the presidential caucus every 4 years. But this year, interestingly, no postcards got mailed. Lack of money is not an issue, as just yesterday the party's treasurer reported to the Federal Election Commission and the State Campaign Spending Commission more than $90,000 cash on hand as of 31 December 2016. Just imagine the outrage if the Democrats who control Hawaii's state government and state office of elections refused to inform all voters when and where they could vote . . . or maybe just alerting SOMEof them where they could vote. There would be an outcry and lawsuits and even riots. Well, that is precisely what is going on right here in the Hawaii GOP. According to public statements by RINO party chair Fritz Rohlfing, the Hawaii GOP has 33,000 card-carrying members. HIRA has already heard from many of them that they don't know anything about upcoming caucuses starting today through February 14th. That's because absolutely no effort is being made to reach all 33,000 eligible voters for the 51 state house caucus elections (an average of 650 card-carrying Republicans per house district left in the dark). HERE'S WHY PARTY LEADERS CHEAT EXTENSIVELY FOR THE NEXT TWO WEEKS DURING 'CAUCUS SEASON' : There are 51 district chairs eligible to sit on the party's leadership panel - the State Committee. Right now, most of the existing 51 chairs have been appointed by Team Hellreich because these positions were vacant. Typically these appointees have proven to be do-nothing zombies and Hellreich supporters who do whatever top party officers tell them to do (esp. voting a certain RINO way at meeting), if they even bother to show up to meetings at all. Now, Team Hellreich wants to keep the State Committee powerless and puppet-like. If these caucus elections are unannounced and barely anyone shows up, RINO allies of Hellreich and Rohlfing can easily elect themselves without opposition. Even better, no caucus election will take place at all due to deliberately poor planning/promotion and Team Hellreich gets to appoint whomever they want into the district chair positions. It's all about control. And that's why the annual postcards were cancelled. "You need to know how many delegates (for the state convention) to recruit at your upcoming Precinct / District Caucuses. And, by the way, you may recall that the window for Precinct / District Caucuses was moved from Jan 25 thru Feb 7 to Feb 1 thru Feb 14. So get your gray matter moving on planning Precinct / District Caucuses and start lining up folks who will be likely to fill vacancies and help lead us forward." SMOKING GUN : It's absolutely not the job of party leaders to use their official positions and official party resources (contact lists, etc.) to stack the deck in their own favor by "lining up folks". Party officers have no business 'recruiting' those who will become delegates. That's like telling poll workers to spend the months leading up to Election Day by only contacting their friends who plan to vote for Democrats. The job of party officers is to cast a wide net and maximize participation. How caucus elections turn out is not a system to be 'gamed' by party insiders. But that's why nothing has changed for years. Cheating, pure and simple. In another secret e-mail from Team Hellreich henchman and RINO Hickling in late November to fellow party officers, he indicated that he briefly considered casting a wide net to all party members as party rules require. In fact, Hickling promised 'heavy promotion' of caucuses. "I'd like to get the (caucus) promotion effort moving before" mid-December, Hickling told state committee members after the general election. But the plan to promote these critical meetings was obviously cancelled in the days following the 2016 election blowout. 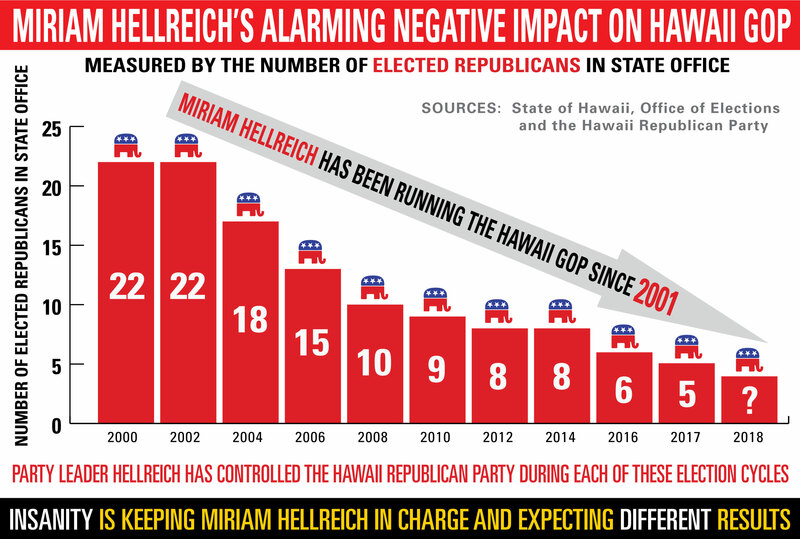 Indeed, Hickling must have been vetoed by one of his campaign-of-cheating ringleaders at Team Hellreich, because the Hawaii GOP's "promotion effort" for the caucuses has remained at a complete standstill to this very day. In reality, there has been ZERO promotion of the caucuses. In an unprecedented move, the party dispensed with sending postcards to all members . . . but undermining the caucus elections didn't stop there. 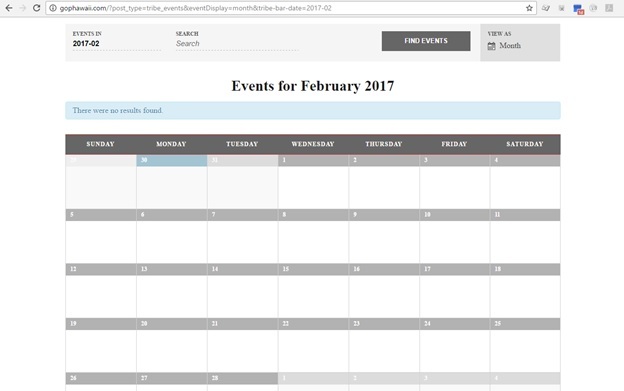 MAJOR CHEATING #2: Party Website Calendar "completely blanked out" for February 2017. You read that right, as of right now, our party's official calendar for the next two weeks is completely blank. There's not a single entry for any of the 51 caucus elections scheduled on any day during the next two weeks. With caucuses required to get started today, you gotta give these RINO cheaters credit. It's a brilliant tactic in the year 2017 to keep card-carrying Republicans in the dark by wiping out every single calendar entry from the official party website. They know it's virtually impossible to "vote the bums out"
SMOKING GUN : Since the advent of the internet, the Hawaii GOP website ( www.GOPHawaii.com ) has listed the dates, times, and locations of the 51 house district caucus elections. Suddenly in 2017, party leaders are taking steps to sanitize the website to remove any hint of caucus locations and schedules. As of 10pm last night, the website's calendar was BLANK and there was no listing of caucuses, even though there is a 7-day notice requirement to all party members for these crucial meetings. And while Fritz Rohlfing didn't even bother to put the caucus dates/times/locations on the party's own website, the website is still promoting ticket sales for a Linda Lingle fundraiser held one month ago. No postcard notices. No website notices. Obviously, party leaders had no intention of promoting these elections so that 33,000 eligible members could participate. GET THIS : They've even gone so far as to HIDE THE OFFICIAL CALENDAR, leaving no trace on the website to even locate the calendar. This is devious stuff from devious RINO's who are determined to keep the caucus elections on the down low, so they can pick their own 'yes men' district chairmen later. The only way HIRA was able to locate the party's official party calendar was to perform an advanced Google search and scroll through pages and pages of hits. These guys are clever. Imagine if the Democrats at the State Elections Office pulled this crap. As Donald Trump might say, they'd be in jail for rigging an election. 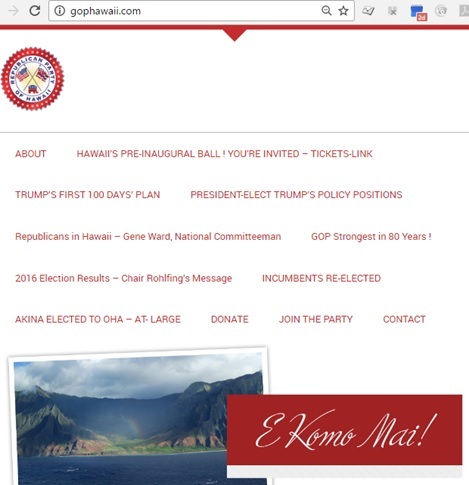 However, evidence of calendar entries and other promotion going back to past years is all over the Hawaii GOP's website. 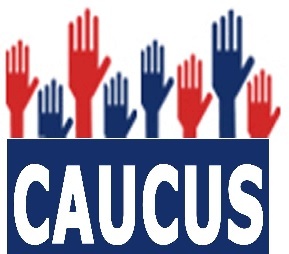 Click HERE to see the 2016 schedule of caucuses. Click HERE to see the party website's calendar of caucus meetings from 2015 and HERE to see a detailed schedule of these elections posted on the website. Go back in time HERE to learn about promotion of the 2013 caucuses. No such promotion exists in 2017, because party leaders do NOT want you participating. It's too risky. If you show up at your district meeting, you might not like the direction RINO party leaders have taken the Hawaii GOP and you might vote to toss them out. Even if the party website and calendar were to be suddenly updated with caucus meeting information, it would be too little too late, and would already violate party rules for official meeting notification. These cheaters know what they are doing. And they stand ready to ignore any complaints. OTHER SUPPRESSION TECHNIQUES : Let's give them the benefit of the doubt. You might think that party leaders are perhaps using 'social media' to spread the word about these caucuse to Republicans. Nope. As of today, February 1st, there's not a peep about the precinct caucuses or district elections on either Facebook or Twitter . Moreover, in past years, the state party has even taken out large ads in newspapers to spread the word to card-carrying Republicans statewide. Nope, not this year. Moreover, HRP has been refusing to provide existing district chairs with e-mail addresses to directly contact party members in their own districts about these caucuses or about anything else. Party leaders have explicitly told these district leaders that the top officers at headquarters want to tightly control all communication with the 33,000 party members. All requests for communication MUST go through top party officers -- the very RINO's trying to control the outcome of the caucuses and conventions. NOW, THE BIG ENCHILADA OF CHEATING : The 2017 State Convention has been improperly MOVED from Oahu to Kauai in violation of party rules. One year ago. February 2016. That was the DEADLINE for any one of the neighbor island's county GOP organizations to volunteer to host the May 2017 state convention. 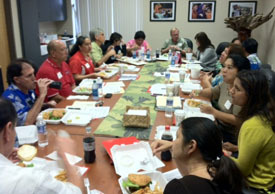 But, NONE of these outer island Republican county organizations volunteered by that deadline. So, pursuant to Section 201 of the state party rules , with neither the Big Island, Kauai, or Maui opting in, the 2017 State Convention had to be held on Oahu. According to that same black-letter party rule, the only way to change the convention venue would be to have the State Committee vote to move the convention for "extraordinary circumstances". The State Committee never took such a vote. Moving to Kauai was never even on the agenda. Following the disastrous 2016 General Election results, RINO party leaders knew they had egg on their faces. So they suddenly and casually announced without fanfare that the 2017 State Convention would take place on Kauai. With nearly a year since the expired deadline to make such a move legally, party leaders didn't even have a date or location for any convention on Kauai. This sneaky relocation maneuver was simply thrown out there. 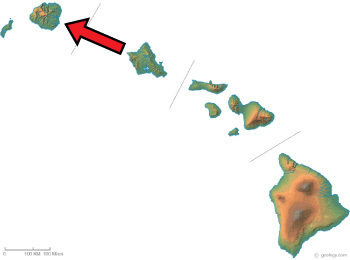 But WHY move the convention from the most populated county of Honolulu to the least populated county of Kauai where no Republicans are even elected to office; not a single one? HERE'S WHY : Team Hellreich knows that, historically, very few Republicans ever attend state conventions when these are held on the neighbor islands. In some past years, barely 140 people would show up (counting delegates, alternates, dignitaries and guests). The dishonest RINO's also know that if they cheat during the caucuses (which they are) and suppress turnout so they can appoint their friends to be in charge of as many districts as possible, they control who gets to be the delegates to the state convention; crookedly rigging the outcome in their favor like usual. Democrats call maneuvers like this "voter suppression" because it keeps people from participating at all. While most suppression that Democrats complain about is shibai, what Rohlfing's gang of cheating RINO's is doing actually works to kill participation. Ever since the improper announcement by Hellreich that the state convention would be moved to Kauai (even pretending it was going to be held there all along), Republicans across the state (not just on Oahu) tell HIRA that they are less inclined to participate because they've been planning since February 2016 for the May 2017 state convention to be held on Oahu, as it is supposed to be. But these prospective participants got really thrown and discouraged by the sudden and illegal and improper post-election announcement of the convention being mysteriously relocated to Kauai without any legal authority under party rules. Indeed, a complete review of all available agenda and minutes of party leadership meetings (both Executive Committee and State Committee) reveal that a proposed move of the state convention to Kauai was never approved. This is a purely defensive move to ensure low turnout of party members at the state convention in order to make it easier for Team Hellreich to retain control of the party organization from top to bottom. 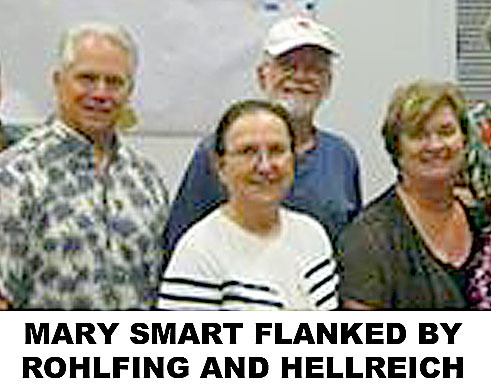 Party officers thought to be 'conservative' like state treasurer Mary Smart, state coalitions vice-chair Karen Jensen, and Big Island county chairs David Yonan and David Ross have been noticeably silent about all this cheating. When you consider the legal and fiduciary duty of Treasurer Smart in this matter (though she's repeatedly turned a blind eye to cheating and rulebreaking in the past), it begs the question if Mary Smart will participate actively in the corruption by signing checks to the Kauai meeting facility and for related expenses for a rigged, rulebreaking, improperly located state convention. Thus far, Smart -- a major party donor and hanger-on who wastes thousands per year of her own money for the perceived 'status' of funding the party's extremely high monthly overhead -- has been silent about her likely abandonment of fiduciary responsibility to follow party rules and approved budgets. Word on the street is that Smart has NOT refused to assist her fellow executive officers in their transparent attempt to create so many obstacles to participation in electing party leaders in 2017. 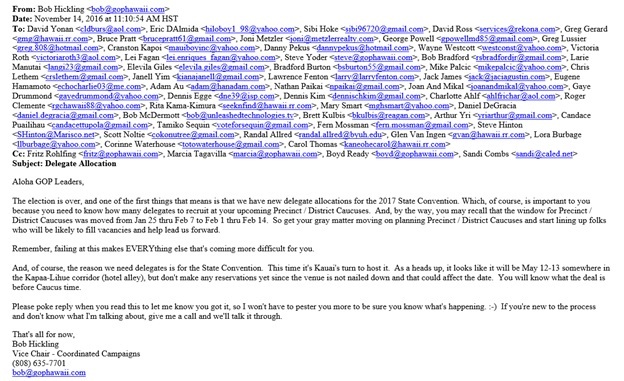 Once again, the missed deadline for a neighbor island to 'host' the state convention was February 2017 -- one year ago. 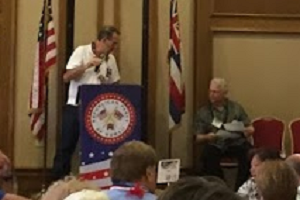 Those in attendance at the May 2016 state convention heard state chair Rohlfing make an explicit appeal from the podium for neighbor island counties to volunteer to host the 2017 state convention. At this point, with hundreds at last year's convention witnessing Rohlfing's very public admission that neither Kauai, Maui nor the Big Island had opted-in to host the convention by the deadline three months earlier, nearly everyone in the room knew that the next state convention would again be on Oahu. That's why the Kauai location didn't get announced until after the disastrous November 2016 general election. Team Hellreich knew they needed to move the state convention to another island where it would be easier to control the outcome of party officer elections; easier to keep from being tossed out after decades of driving the GOP into oblivion here. Yes, dishonest party leaders are cheating. 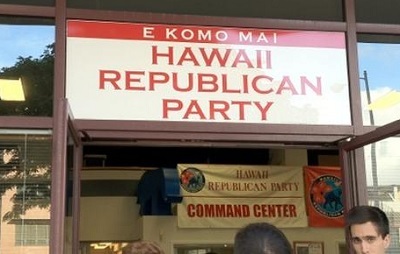 And the big enchilada of cheating is moving the GOP State Convention where the Hawaii GOP's top officers are selected. You've never seen cheating this bad. REMEMBER, THESE ARE THE GUYS WHO ALREADY TRIED CHANGING THE RULES FOR SELF-PRESERVATION: You know what these people are capable of. This kind of manipulation is hardly unprecedented. Hundreds of Republicans at last May's state convention in Waipahu witnessed the sleight of hand that RINO party officers tried to pull. Fritz Rohlfing, Nathan "The Profit" Paikai, and blogger Andrew Walden pushed hard for a rule change to keep Rohlfing and his do-nothing RINO party officers in control of the party for an extra year (through the 2018 election year); even though their disastrous two-year terms of office were set expire this May. Clear-minded delegates to the state convention defeated this crooked maneuver by a 4 to 1 margin, leaving Rohlfing and Walden looking pretty stunned and disappointed on stage in the aftermath of the vote. Just imagine if Obama had tried to extend his term in office to stay in power even longer by changing the rules? That's why outraged delegates spoke out forcefully and voted overwhelmingly against Team Hellreich's crooked gambit. 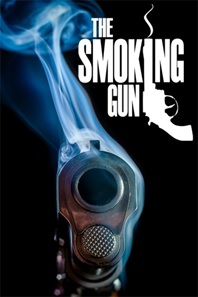 YES, THE FIX IS IN: It couldn't get any clearer than the explicit 'smoking gun' admission by Rohlfing's deputy Bob Hickling about planning to rig the outcome of the precinct caucuses and district elections. This deliberate attempt to manufacture the outcome of these caucuses is a classic Team Hellreich maneuver to retain control by only allowing a handful of RINO allies to show up for these 51 district elections. BUT WHAT SHOULD YOU DO? : While HIRA considers legal options to counter the blatant cheating by RINO party leaders, you must find a way participate. Even though party leaders are obviously cheating, HIRA still encourages you to participate since we cannot be sure that a legal challenge will result in a ruling for party leaders to reschedule and publicize these caucuses to elect party leaders. The only way that district chairs can be elected legitimately on the night of their respective caucuses is if ALL 33,000 Republicans were notified in advance of their respective caucuses. HIRA already has overwhelming evidence that this has not taken place and that widespread cheating is underway by party leaders. So, until any legal challenges are considered, it's imperative that all card-carrying members of the Hawaii GOP attend one of the 51 district caucus meetings statewide during the first half of February to elect reform-minded (non-RINO) district chairs, delegates, and representatives to important committees which decide our platform (currently 100% neutral on issues), our party rules (needing to be tightened up), and convention credentials (a major component to the RINO cheating and election rigging each year). Cancelling the illegal Kauai state convention and quickly scheduling a proper state convention on Oahu. Stopping all the RINO cheating and corruption which keeps the Hawaii GOP from realizing its potential. Open discussion about these items at your district caucus will help greatly to figure out who in attendance is on the wrong side of these issues. If these items are NOT on the agenda, be sure to insist on talking about them -- otherwise the wrong people could end up running out party for the next two long miserable, unproductive years. Lesson to all: Get the right people into party office, even at the distric level. You don't want to end up electing do-nothings like Ellie Giles and Brad Burton who just sat there and refused to do their party leader jobs while watching Sam Slom get clobbered. 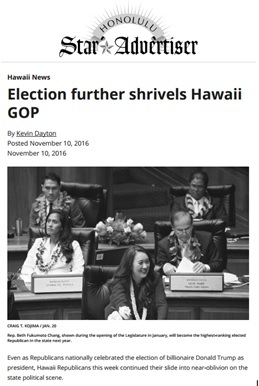 The future of the Hawaii GOP and the hope of electing Republicans to state, local and national office rests in your hands. The consequences of electing do-nothings is that you lose the State Senate and have the only legislative body in the country with ZERO Republicans. DEMAND INFORMATION : So call Hawaii GOP headquarters at 593-8180 and demand that these cheaters tell you when and where to go for your precinct/district caucus. Caucus 'season' starts today and ends on February 14th. Your caucus MUST occur sometime during this 14-day period. RINO's are counting on either the wrong people getting elected (their people) or no caucus taking place at all (so they can appoint their buddies to fill vacant positions). 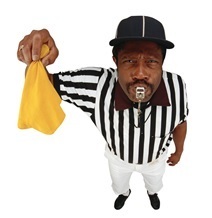 There's too much at stake for their cheating to go un-countered . . . or unpunished. Under Section 304 of party rules, "Reasonable efforts shall be made to give at least seven days' notice of all meetings to all members of the body." So party members should expect to officially find out from somebody about their precinct and/or district election meetings with 7 days notice. It's pretty clear that party rules obligate party officers to provide notifications about meetings and that these meetings be held. But 'reasonable efforts' are NOT being made - deliberately. Call party headquarters at 593-8180 and demand to know when, where, and why you weren't told. CAMPAIGN OF DELIBERATE NON-PROMOTION : 2017 was supposed to be the year that our troubled party could finally get some new leadership. You'd think that failed party leaders would be so humiliated by recent ballot box losses and party scandals that they would gladly step aside. But, no, this RINO cabal of closet Democrats plans to maintain control of our party for as long as they can. 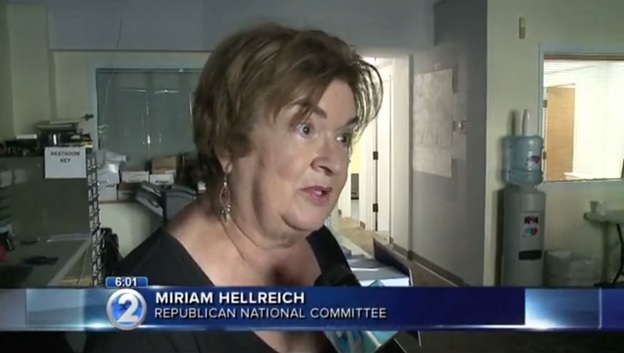 Widespread cheating by Miriam Hellreich's RINO henchmen is already underway. These top party officers are stopping at nothing to stay in charge so they can continue not fighting for anything and maintaining the standdown order which has been in effect for years. HIRA knows that select party insiders are getting invited to participate in these mostly secret caucuses while 90+% of other party members haven't heard about the caucuses at all (or are being given less than the required 7 day notice, as in the case of RINO district chair Brad Burton). Indeed, dozens of card-carrying Republicans throughout all 51 state house districts have alerted HIRA they have received no official notification from the party at all. This makes it virtually impossible for any challenger to the RINO leaders of Team Hellreich to realize success in getting elected to reform our party. OUR PARTY IS BROKEN : Voters in Hawaii won't give the GOP a second look (nor will potential candidates, donors, volunteers, members, or the media) unless there's been a clean sweep of our corrupt, self-dealing party leadership. We must drain the swamp. The crooked goal of RINO's is to keep our party weak, worthless, and under the control of this person pictured below. 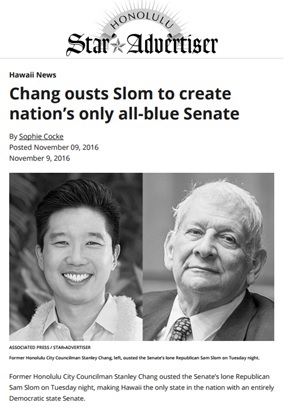 Hawaii can't afford another 62 years under Democrats; especially when RINO's like Hellreich, Rohlfing, Fukumoto, Saiki, Marumoto, and the rest support the failed policies of Democrats. Please do what you can to attend your caucus and vote for change. Become a delegate. Serve on a committee. Help fix our party so we can win elections and then fix Hawaii. Mahalo!! Folks, what we need more than anything is a political party which is under completely new management. 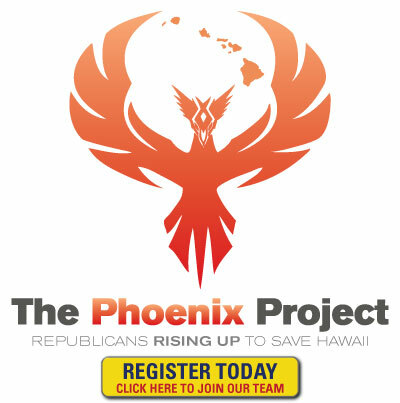 So, if you also want a Hawaii GOP which challenges Democrats, challenges the liberal media, challenges failed policies, and works 24/7/365 to help make the Republican Party the majority party in Hawaii, then please join The Phoenix Project -- a coalition of conservatives and 'real Republicans' united to bring positive changes to our party in 2017 so we can start to fix the many problems in Hawaii. 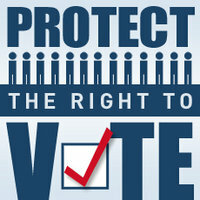 For more information on how you can get involved and to register, please go to GOP Reform: Project Phoenix . Mahalo!